Dabney Wharton Coleman (born January 3, 1932) is an American actor. Coleman's best known films include The Towering Inferno (1974), 9 to 5 (1980), On Golden Pond (1981), Tootsie (1982), WarGames (1983), Cloak & Dagger (1984), The Beverly Hillbillies (1993), You've Got Mail (1998), Recess: School's Out (2001), Moonlight Mile (2002), and Rules Don't Apply (2016). Coleman's television roles include the title character in Buffalo Bill (1983–1984), Burton Fallin in The Guardian (2001–2004), the voice of Principal Peter Prickly in Recess (1997–2001), and Louis "The Commodore" Kaestner in Boardwalk Empire (2010–2011). He has won one Primetime Emmy Award from six nominations and one Golden Globe Award from three nominations. Coleman was born in Austin, Texas, the son of Melvin Randolph and Mary Wharton (née Johns) Coleman. He entered the Virginia Military Institute in 1949, then studied law at the University of Texas before turning to acting. He was drafted in 1953 to the United States Army and served in Europe. Coleman is a character actor with roles in well over 60 films and television programs to his credit. He trained with Sanford Meisner at the Neighborhood Playhouse School of the Theater in New York City from 1958-60. 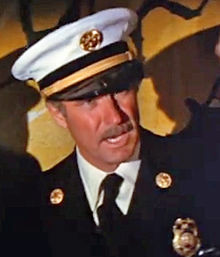 Early roles in his career included a US Olympic skiing team coach in the 1969 Downhill Racer, a high-ranking fire chief in The Towering Inferno (1974), and a wealthy Westerner in Bite the Bullet (1975). He portrayed an FBI agent in Attack on Terror: The FBI vs. the Ku Klux Klan (1975). He landed the main antagonist part of Franklin Hart, Jr., a sexist boss on whom three female office employees get their revenge in 1980's Nine to Five. It was this film that established Coleman in the character type he is most identified with and has frequently played since - a comic relief villain. Coleman followed Nine to Five with the role of the arrogant, sexist, soap opera director in Tootsie (1982), further enforcing audiences' identification of him as a smarmy, devious foil to a film's main character. He broke from this type somewhat, however, in his portrayal of military computer scientist John McKittrick in WarGames (1983). Since then, Coleman has consistently shifted between roles in serious drama and comedies. Coleman received his first Emmy nomination for his lead role in the critically acclaimed, though short-lived, TV series Buffalo Bill. In 1987, he received an Emmy Award for his role in the TV movie Sworn to Silence. He appeared in the feature film On Golden Pond (1981), playing the fiancé of Chelsea Thayer Wayne (Jane Fonda). Coleman played a Hugh Hefner-ish magazine mogul in the comedy Dragnet (1987), Bobcat Goldthwait's boss in the 1988 talking-horse comedy Hot to Trot, and befuddled banker Milburn Drysdale in the feature film The Beverly Hillbillies (1993). Coleman played Gerald Ellis in Clifford (1994). From 1997 to 2001, Coleman provided the voice of Principal Prickly on the animated series Recess. He also played a philandering father in You've Got Mail (1998). More recently, Coleman appeared as a casino owner in 2005's Domino. He received acclaim as Burton Fallin in the TV series The Guardian (2001–04). For two seasons, from 2010 to 2011, Coleman was a series regular on HBO's Boardwalk Empire. On November 6, 2014, Coleman received a star on the Hollywood Walk of Fame. Coleman resides in Brentwood, California. He has been divorced twice. He was married to Ann Courtney Harrell from 1957 to 1959 and Jean Hale from 1961 to 1984. He has four children, including three by Hale: Kelly, Randy, and singer Quincy. In 1998, Coleman worked with fellow actor Bronson Pinchot at the Biltmore Estate in Asheville, North Carolina to help protect local forests and helped lead a campaign to educate others on how to care for and protect forests nationwide. Coleman is an avid tennis player, winning celebrity and charity tournaments. He played mainly at the Riviera Country Club as well as in local sanctioned tournaments. 1980 9 to 5 Franklin M. Hart, Jr.
1961 Naked City Resident Episode: "Landscape with Dead Figures"
1964 The Alfred Hitchcock Hour Tom Esterow Episode: "Dear Uncle George"
1965 The Donna Reed Show Rallye Master Episode: "A-Haunting We Will Go"
1967 Dundee and the Culhane Sheriff Wrenn Episode: "The Jubilee Raid Brief"
1969 The Mod Squad John Episode: "The Guru"
1974 Kojak Alex Linden Episode: "Therapy in Dynamite"
1976 The Mary Tyler Moore Show Congressman Phil Whitman Episode: "The Seminar"
1979 Diff'rent Strokes Fred Tanner 2 Episodes "Arnold's Girlfriend (Parts 1 & 2)"
1997 The Magic School Bus Horace Scope Voice, Episode: "Sees Stars"
1997 Jumanji Ashton Phillips Voice, Episodes: "The Palace of Clues" and "An Old Story"
1998 My Date with the President's Daughter President Richmond Episode: "My Date with the President's Daughter"
2006 Lilo & Stitch: The Series Principal Peter Prickly Voice, Episode: "Lax"
2009 Law & Order: Special Victims Unit Frank Hager Episode: "Snatched"
2016 Ray Donovan Mr. Price Episode: "Federal Boobie Inspector"
2019 NCIS Cpl. John Sidney Episode: "The Last Link"
2019 For the People (2018 TV Series) Donald Newman Episode: "One Big Happy Family, S2 E5"
^ The Complete Directory to Prime Time Network and Cable TV Shows, 1946-Present. Ballantine Books. 2003. p. 1437. ISBN 0-345-45542-8. ^ Saval, Malina (6 November 2014). "Dabney Coleman Receives a Star on the Hollywood Walk of Fame". Variety. Retrieved 6 November 2014.